NHEW is focused on increasing national awareness on major public health issues and promoting a better understanding of the role of health education. Join SOPHE, its chapters, members and partners every October for events, webinars, and activities across the country. In 2018, let’s raise awareness of the importance of our future health education specialists in improving consumer health and wellness. 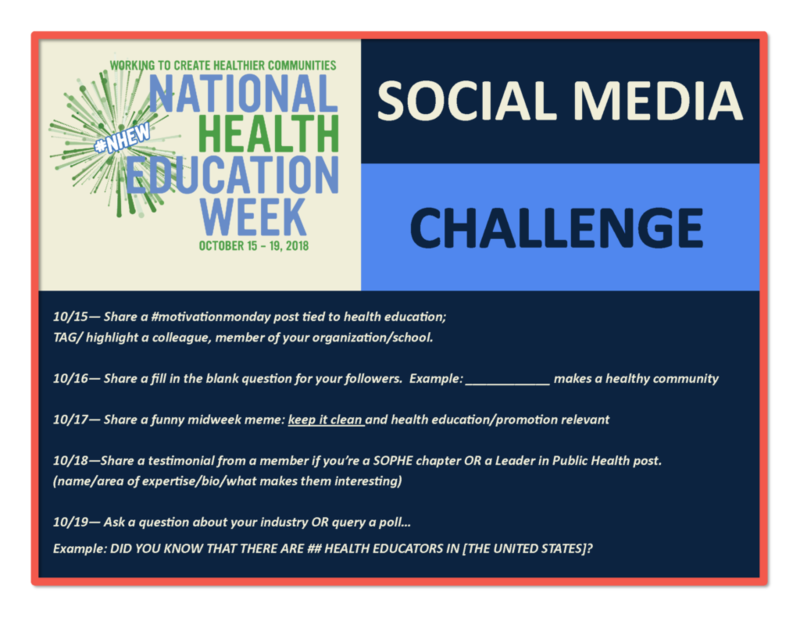 NHEW 2018 will amplify SOPHE’s most recent initiative #MyImpact to promote the profession of health education and the work of health educators across all public health settings. Together we make an impact – share your public health contribution via #myimpact tweet, Facebook post, Instagram update, LinkedIn update or send SOPHE your impact statement. We’ll post and share – together let’s make an impact!